You might have seen our blog post about Saint Paul’s defining moments of 2015. While we’re still proud of what’s happened here, we’re also looking forward to what’s next. This is about to be a huge year for sports in Saint Paul. In the first two weeks of January, we hosted the 2016 Prudential U.S. Figure Skating Championships, which help determine the U.S. Figure Skating team in the PyeongChang Olympics. We also showed 1988 Olympic gold medalist and TV personality Brian Boitano around the Saint Paul food scene in a culinary competition. 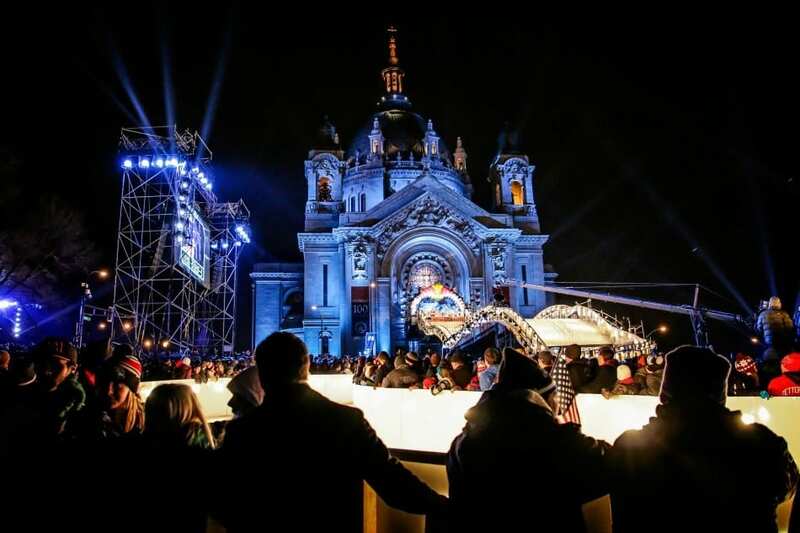 Not only will the Coors Light Stadium Series be a great place for the Wild to beat the Chicago Blackhawks, but the following weekend is the finale of the 2016 Red Bull Crashed Ice (that’s a photo from last year’s above) run. Not enough skating for you? We’re also hosting the Big Ten Men’s Hockey Tournament. Summit Brewing Company, one of the kings of Minnesota’s craft beer scene, will celebrate its 30th birthday. Thousands came to celebrate the 130th Saint Paul Winter Carnival in January, and the National Park Service is offering free admission to fourth graders at all parks in honor of its 100-year anniversary. There are so many Adele puns to be made, but we are thrilled that Saint Paul will have some of the biggest best music from both national and local musicians this year. While the big names will make themselves heard at Xcel Energy Center (Bruce Springsteen! Adele! ), the locally curated shows are on point this year; we highly recommend the Twin Cities Jazz Festival, and Rhymesayers brings Sound Set back to the city this year. We can’t forget about the reopening of the Palace Theater, which is rumored to be the Saint Paul rival to Minneapolis’ First Avenue. If you’re doing St. Patrick’s Day correctly, you’re doing it in Saint Paul. This year, we’ll have the 50th annual St. Patrick’s Day parade take over the streets downtown. Last year, we created a day-long street party, LuckyPalooza, and had crowds come down to celebrate on West 7th. There’s a surprise planned for this year’s party, and we can’t wait to share with you what’s coming up. Have you ever hand-fed a giraffe? What’s behind the scenes of a baseball game? What’s the deal with the castlesque building in downtown Saint Paul? In 2016, we’re debuting Saint Paul’s Signature Experiences, group tours that will intimately acquaint you with some of the city’s most cherished and memorable attractions. We’ll offer tours of CHS Field, the Landmark Center, Como Zoo and Conservatory, Padelford Riverboats and the Alexander Ramsey house, and we hope you’ll bring your group to join us. The largest day-long party in the Midwest is trying its hand at two days of food, music, drinks, vendors and more. This staple event on Grand Avenue attracts 270,000 people, and it’s Saint Paul’s kick off to the summer. We’re excited to see the fun a second day will bring, and we’ll see you at the parade! It’s no secret that Saint Paul’s food scene was stellar in 2015, and we’re sure to see new restaurants that impress us this year. Lowertown is expecting the opening of Handsome Hog and Parco 400. The Lexington, an iconic restaurant in Saint Paul, hopes to reopen its doors this spring. It’s been awhile since the old bus barn site’s been used, but we’re going to see the Minnesota United FC begin construction on the new MLS stadium site. The architecture and construction firms selected to build the stadium also designed the Xcel Energy Center, Target Field and TCF Bank Stadium–all major players in the Twin Cities sports scene. What are you most looking forward to seeing or experiencing in St. Paul during TBEX? Leave your answer in the comments. Author bio: This is a guest post written by TBEX sponsor, Visit Saint Paul.